Save AED 0 (0%) Earn 272 Shukrans What is Shukran? Shukran is the Landmark Group’s award-winning loyalty programme in the Middle East, which allows you to earn Shukrans when you shop any of our brands. Simple and convenient, this stroller is sturdy and ideal for your kid. 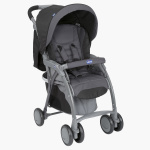 Featuring a canopy top with a peek-a-boo window this stroller protects your little one from harsh weather conditions. The wide basket lets you place your baby’s essentials.